nvi is the latest incarnation of vi from U.C. Berkeley (it's the vi that ships with BSD 4.4). nvi is free and can use perl as an extension language. Handles lines longer than 1024 characters now, which I've found to be a tremendous improvement (many of the vi clones can also handle really long lines, too). In addition, nvi supports multiple buffers, unlimited undo, is 8 bit clean, and has command-line editing and filename completion. Current version is 1.79. 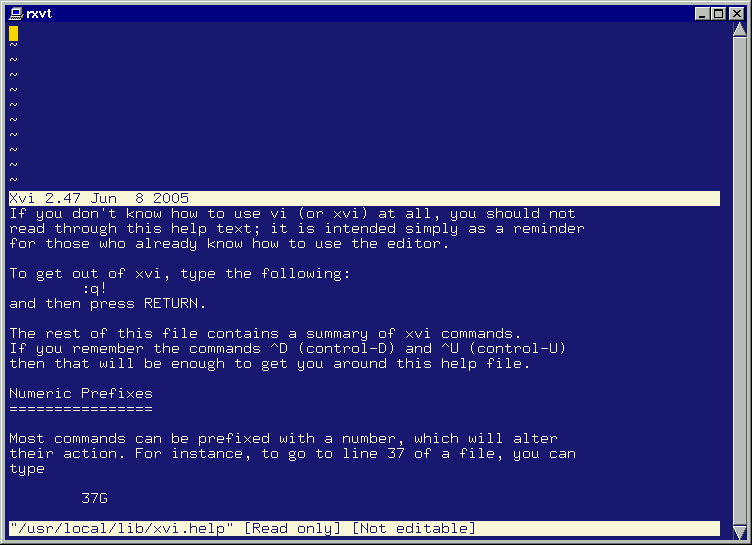 Nothing fancy about the way nvi looks...plain ol' vi in a terminal window; I didn't expect you'd need a screen shot of that. Also included at this site is the vi FAQ. See also the nvi development page. Elvis [V2.0 SCREEN SHOT 14K PNG]is a free vi clone written by Steve Kirkendall (kirkenda@cs.pdx.edu) that offers multiple buffers, multiple windows, and multiple display modes. In its most recent incarnation (beta test v2.1g -- this is the first 2.1 beta, meaning all 2.1 features have been added and the only changes will be bug fixes) it provides a very nice X11 interface with a user-definable button bar, syntax highlighting, pop-up dialog windows, and hex editing. 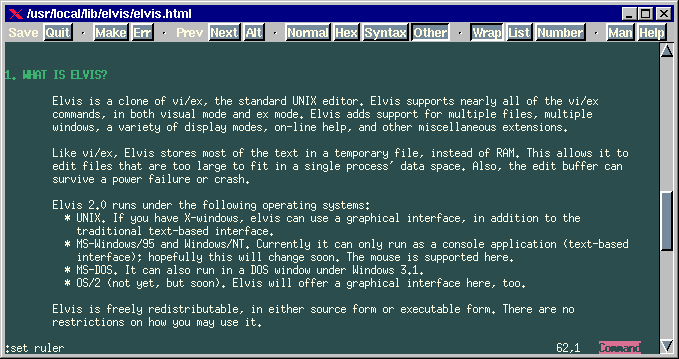 Elvis 2.1 can view and print a significant subset of HTML (its help system is written in HTML). This editor has come a long way in the last year or so, so if you haven't tried it recently, you should now. Version 2.0 is the most recent release version (binaries are available for MS-DOS and Win32, source code for Unix). Version 2.0 has most of the features of 2.1, although the menubar has become more versatile in 2.1. Latest release is 2.1_3 (July 1999). See also: Vile. 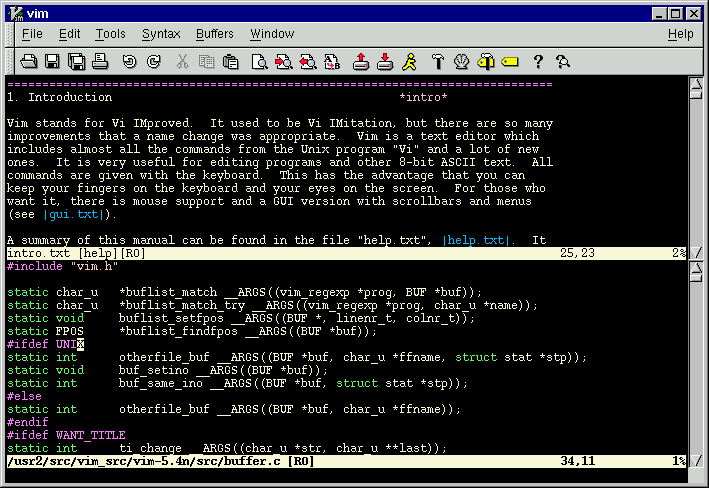 vile stands for "vi like emacs." 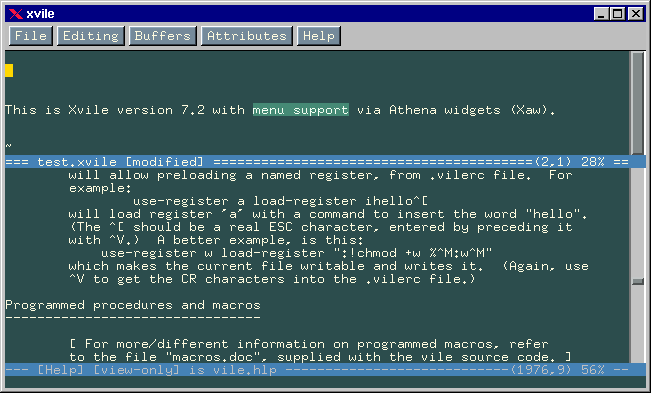 It is a free vi-like editor with many emacs-like features. It has a very vi-like "finger feel" according to its author, although it does not attempt to be a complete vi clone. 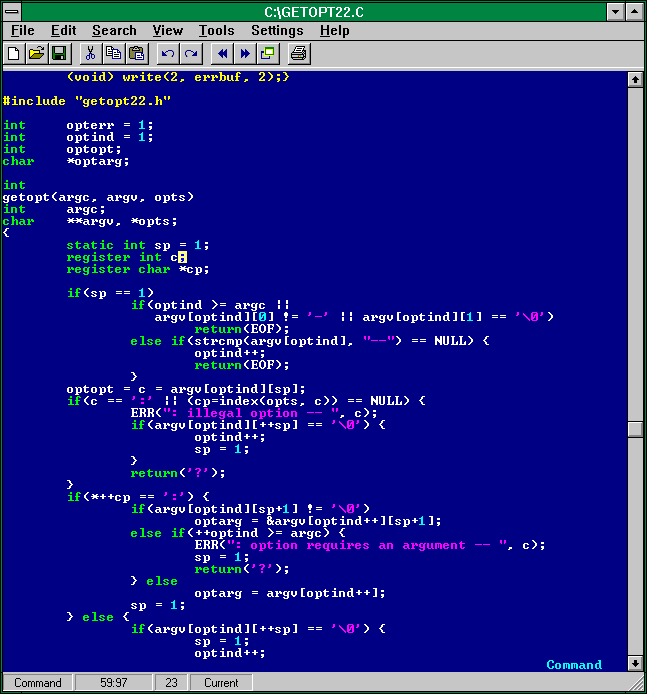 vile includes multi-file editing and viewing, key rebinding, mouse support (in an xterm, or when built as xvile), infinite undo, selection highlighting, rectangular operations, "next error" cursor positioning after compilation, full function-key and arrow-key support, filename & command completion, command/search string/filename history, auxiliary utilities for man page and C program syntax highlighting, built-in macro language, and an interface to Perl. vile ports to all UNIX platforms, VMS, and DOS. 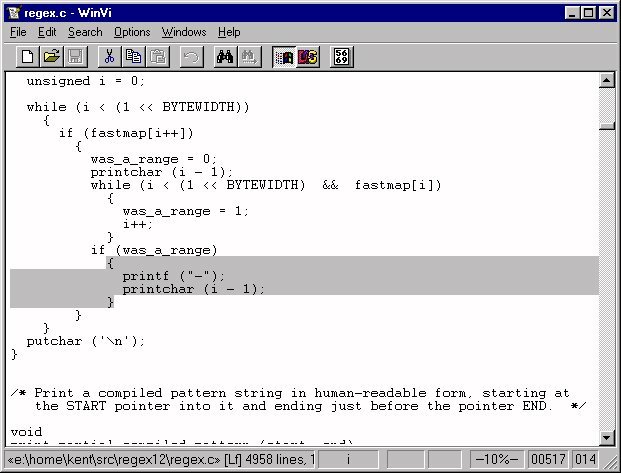 xvile [SCREEN SHOT 11K PNG] is the X11 version of vile, which adds scrollbars, more complete mouse capabilities, and menus when Athena or Motif widget libraries are available. vile and xvile were reviewed in the March 1996 Linux Gazette. 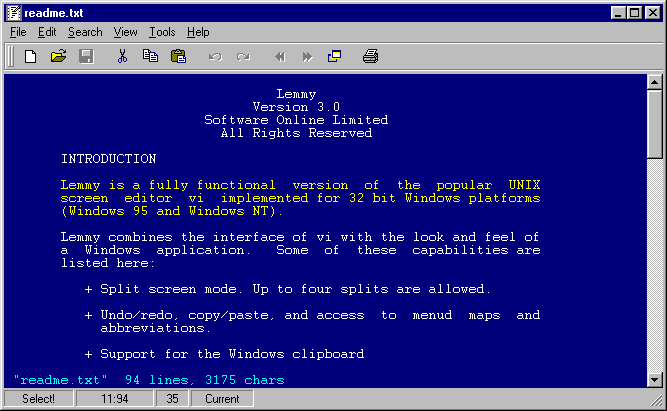 Vile is available for DOS, Win95/NT, OS/2, and as source code for Unix and other operating systems. Lemmy [V2.0 SCREEN SHOT 15K PNG]is a rather interesting twist on the vi theme. It is a vi editor with a windows interface for Win 95, 98, NT4 & 2000 [V3 SCREEN SHOT 10K PNG] (and until recently, Win32s--couldn't find that version last time I looked). Custom (fixed-pitch) fonts, unlimited undo/redo, user-definable & extendable syntax highlighting, and the obligatory Windows-style pull down menus are available, among other features. This is another vi clone that has seen lots of improvement in the last several years. The original author is James Iuliano [bad link]. Lemmy v4.x and newer, are now being marketed by Software Online, Ltd. and a single-user license, which removes nags and affords free upgrades, costs $20 (other licenses available). See also: Lemmy 4.5 at download.com. WinVi [V2.63 on Win95 SCREEN SHOT 60K JPG] is a free Windows vi clone that was designed to be compatible with the Windows Notepad editor. It offers such features as fast startup (does not use DLLs), can edit files as large as virtual memory, background may be set to a bitmap image, and selectable (including True Type) fonts. This editor is still in the relatively early stages of development and does lack true vi compatibility. For example, macros & abbreviations are not available currently. Also, only one active file can be edited for each instance of WinVi running. Still, this is another interesting adaptation of vi to the Windows environment and one to watch as it improves. Versions are available for 16-bit and 32-bit Windows. Oak Hill vi is a shareware program that is available in DOS and Win95/NT 32-bit console versions. It costs $35 to register, which gains the user free upgrades, no more nags, plus user support via e-mail. 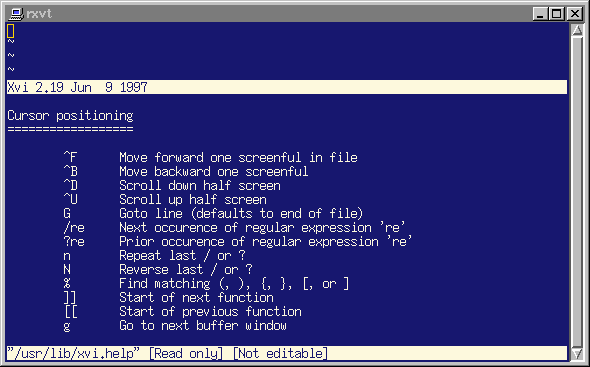 This program, in its Win32 console version, can edit very large files (DOS version is limited to 250,000 characters). Other features include 8-bit ASCII support, 43/50 line display, and on-line help. See Simtelnet Download Page for Oak Hill Vi 7.0a. According to its authors: "Xvi [SCREEN SHOT 8K PNG] is a portable free multi-window version of `vi'. In spite of its name, there is, as yet, no X-Windows-specific version of it, but work is reputedly still in progress. Existing versions use text windows separated by horizontal status lines on character mode displays. The windows may represent different files being edited, or different views on to the same file." Here is a local copy of the source for xvi 2.19 (editor and docs): xvi219.tgz. And here is the source (editor and docs) for xvi 2.47: xvi-2.47.tar.gz along with the obligatory screenshot [SCREEN SHOT 7K PNG]. The source code for xvi 2.15, as well as binaries for MS-DOS, are also available from the vi archive. Xvi was actually my first vi clone experience. It hooked me with its multiple windows and ability to cut and paste between windows. Unfortunately, xvi had a number of incompatibilities with "true" vi, so I moved on to other clones, and of course, "true" vi. Anyway, xvi is still a very serviceable editor with some handy features, including a small memory usage and multiple buffers. xvi also has a Sourceforge site: xvi.sf.net. xvi-2.47.1 for DOS, which includes one bug fix, can be found here in the zip file xvi2471_dos.zip. A recent implementation of vi in Java, still under development. Patterned after vim, it is currently integrated in one application: JBuilder. Mozilla Public License.